Confirming Autocar Professional’s scoop from last week, India's Royal Enfield, one of the largest mid-capacity motorcycle manufacturers in the world, has just showcased its all-new V-twin, 834cc cruiser concept at the ongoing EICMA event in Milan earlier today. Although the main focus of the company was its 650cc twins – Interceptor 650 and Continental GT 650 – which have been officially launched in Europe today, the unveiling of the long-wheelbase cruiser concept underlines Royal Enfield’s aggressive global ambitions. The V-twin, 834cc KX concept is built on the chassis designed by UK-based Harris Performance, now owned by Royal Enfield. According to the company, the engineering and development of this prototype was carried at its UK-based technical centre, details that are in line with what this publication revealed last week. However, it appears that the company did not mention about the development of this V-twin, 834cc engine along with the engineers at Polaris Industries. The company management also did not reveal any further specifications of the all-new liquid-cooled powerplant. 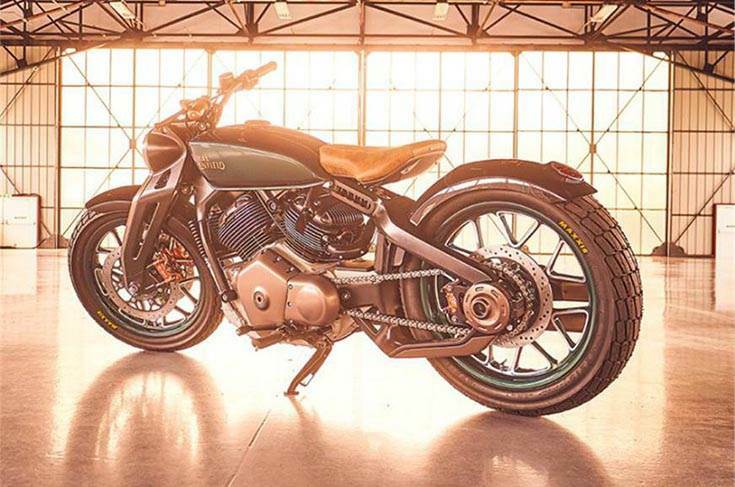 Nevertheless, the V-twin KX cruiser concept clearly puts forth Royal Enfield’s future direction that appear to be aligned with its global plans over the next years. Meanwhile, the Chennai-based motorcycle manufacturer announced the retail prices for its Interceptor 650, which starts from 6,200 euros, and its Continental GT 650, which starts from 6,400 euros (both prices for Italy, Spain and Portugal). For now, the company is keen on making its mark in the European markets on the back of the new 650cc motorcycles.